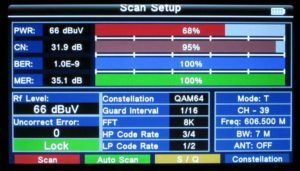 Above, the DVB analyser (the red device) enables a view of measurements whilst adjusting the antenna. The analyser here is connected to the masthead amp output and of course powers the masthead amp. The channels of interest on Knights Hill are 35, 36, 37, 38 and 39. There is a significant slope across the channels, it may be just the uneven gain vs freq of the log periodic array. The weakest channel is 39 and best is 35, so the pointing for best signal strength, observing carefully BER and MER was found for both channels. They coincided (not surprising), but what was a little surprising was that the azimuth was 5° less than the bearing to Knights Hill. 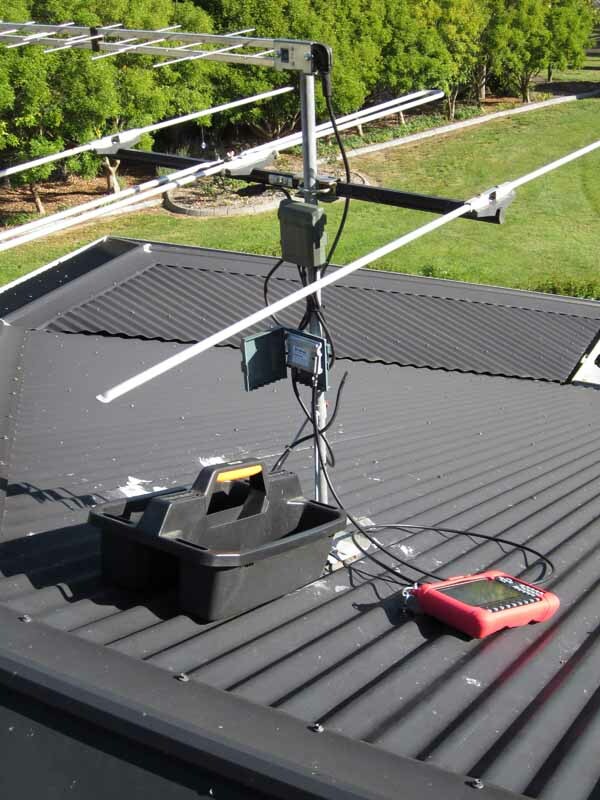 Perhaps the antenna is asymmetric, perhaps the obstructions create the effect. Anyway, an improvement of 3.2dB in C/N ratio was obtained. The analyser does not have facility to save measurements (quite a shortcoming), so pics were taken of a couple of screens at the main TV of the worst channel (39) as an archival record. 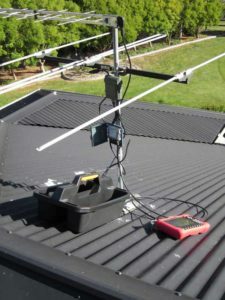 The chain includes a LP antenna, filter, 43dB masthead amp, and two cascaded splitters. 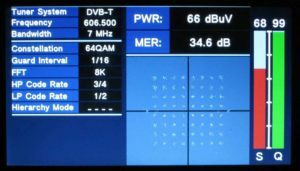 Loss from the masthead amp out to the main TV cable is about 12dB, ie level at the masthead amp is about 12dB higher than shown below. 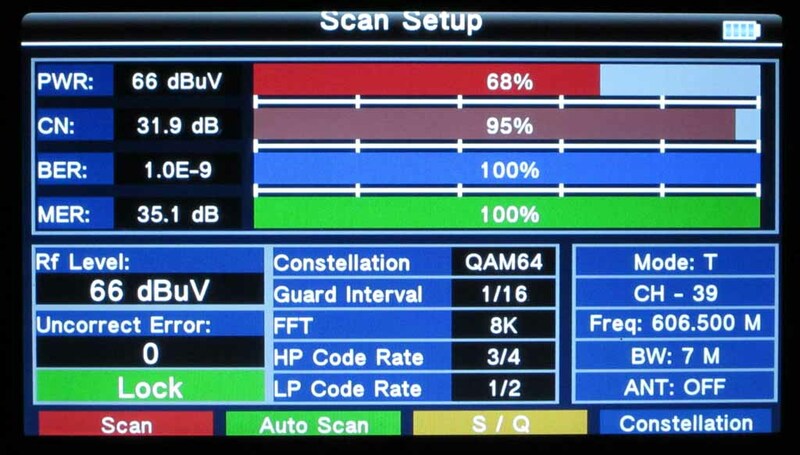 Above, the detail measurement screen. 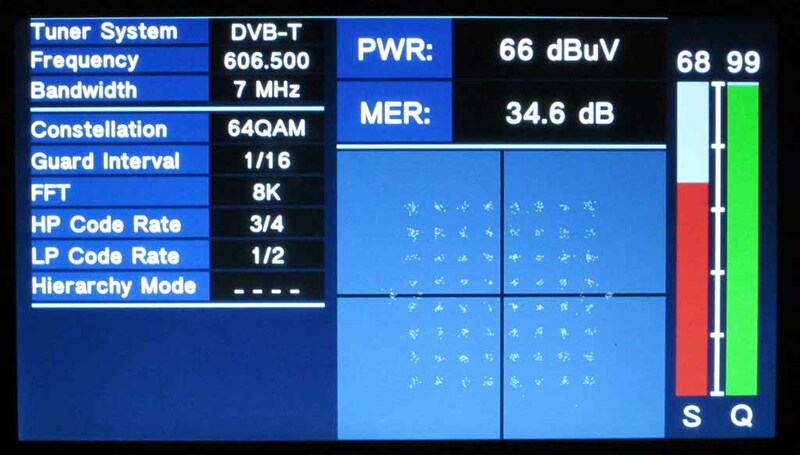 Above, the constellation screen, the detail related to the MER measurement.